Everyone at B&R Painting is held to the highest standards of accountability. Rickey Warbington grew up in a multi-generational family of painters. And, like his uncles and cousins before him, he found that he had a talent for blending efficient techniques with fine craftsmanship. Meanwhile, Rickey’s wife, Beth was sharpening her business acumen, learning everything from business operations to HR management, bookkeeping and accounting. So, it came as no surprise when Beth and Rickey put their skills together to found B&R Painting in 1988. With that in mind, everyone at B&R Painting is held to the highest standards of accountability. They are supported with retirement, health and other benefits. And every member of the team is empowered and encouraged to provide the highest possible customer service. The company is structured such that its veterans monitor and train newer employees to ensure consistency. B&R periodically invests in specialized training for team members, as well, and insists on weekly meetings to address every current, recent and upcoming project. As a direct result, every B&R employee is absolutely professional on every job, every time. 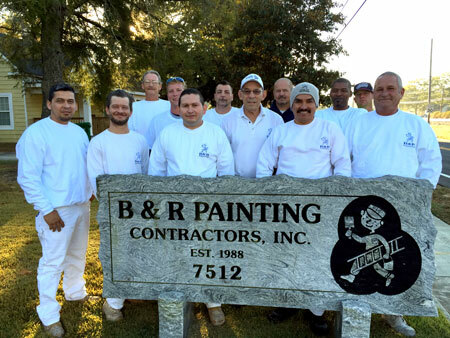 B&R Painting is headquartered in Lithonia, Georgia, and is active in its support of the local schools and community. Contact us to see how we can best serve your business.